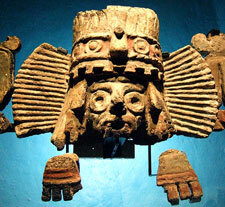 Even quetzal plumes will tear. Only for an instant do we endure. 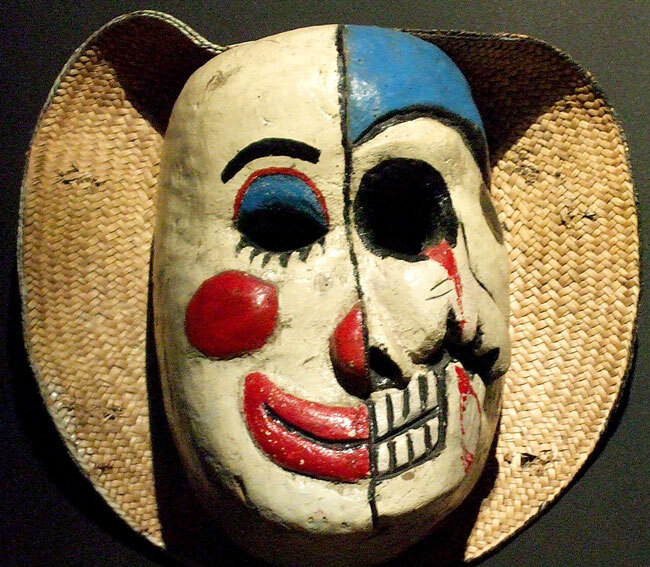 There was a certain fascination with death (so clearly still visible today in the Day of the Dead) - after all, it was a relief from the harshness and suffering of this life. Did they believe in an afterlife? Definitely! Life and death were inseparable parts of the same great cosmic cycle of energy. You simply cannot have one without the other... Life gives way to death and vice versa: in death your body and spirit nourish the Earth and provide roots for new life (such as a flower) to be born (Pic1). Life and death were simply two sides of the same reality (Pic 3): life will follow death as surely as sunrise will follow sunset and the moon will wax and wane. Are flowers carried to the kingdom of death? Is it true that we go. is it true that we go! Are we dead there or do we still live? Do we exist there again? Did they believe in Hell? No. Though there was a strong link between your behaviour in this life, the way you met your death, and what/where your final destiny would be in the next ‘world’, Aztec religion was NOT one based on salvation/damnation. Did they believe in Heaven? Yes - 13 of them! 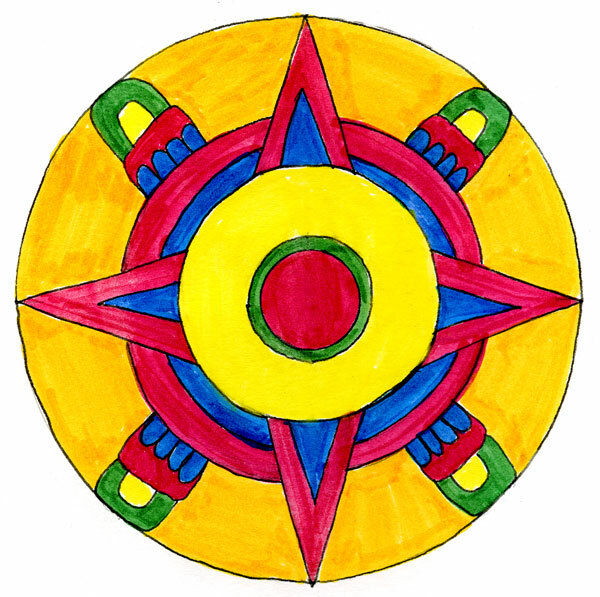 The Aztecs saw the Earth as a giant flat circular disk (sometimes imagined to be an enormous alligator, whose scales were mountains), surrounded by water as far as the distant horizon, where it joined the sky. Their world was at the centre of the 4 great cardinal regions of the universe (N,S,E,W), plus the crucial 5th. central direction/dimension of up and down. 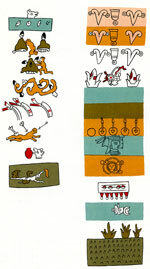 Above the earth rose 13 levels of ‘heavens’ and below the earth were 9 levels of ‘underworld’ (Pic 7). 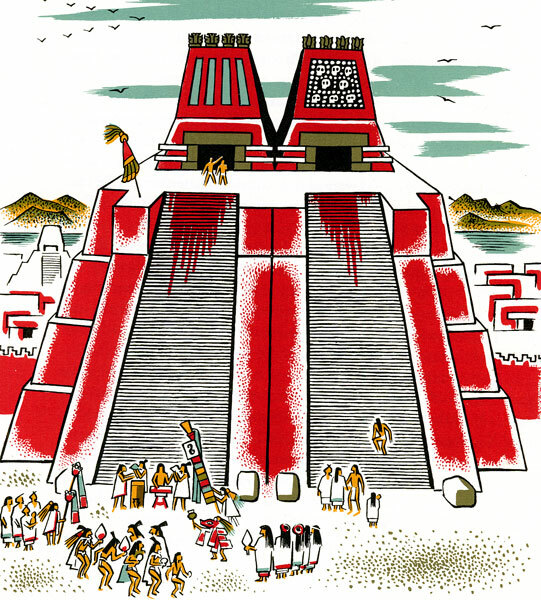 After death, ‘ordinary souls’ - who had died an ordinary death - had to make a hard, 4-year journey down through these levels to reach their final resting place, Mictlan. This really was... the end of the road! 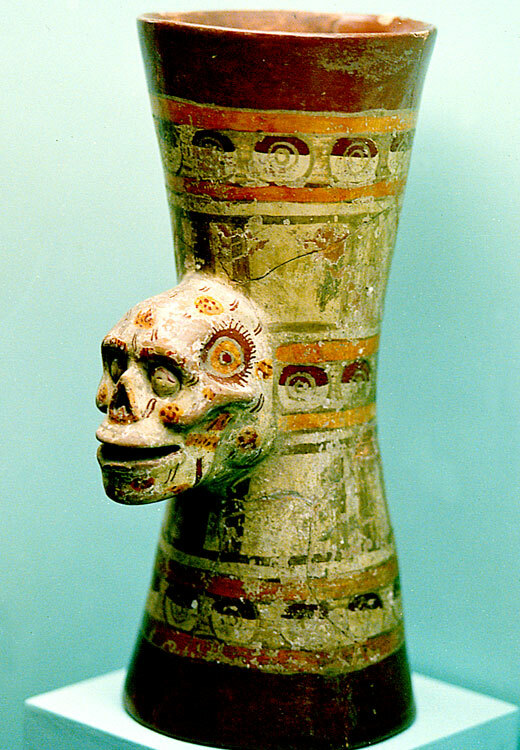 We get the impression that Mictlan may well have been a fairly grimbo place, ruled by a suitably grim-looking god, ‘Lord of Mictlan’ - Mictlantecuhtli (Pic 8). Among the offerings buried with you by your family (Pic 2) were valuable gifts to be handed to him as he welcomed you to Mictlan! So who went up to the Heavens?! Essentially this depended on how you died and - consequently - on which god came to earth, ‘took possession’ of your body, and snatched ‘you’ away. 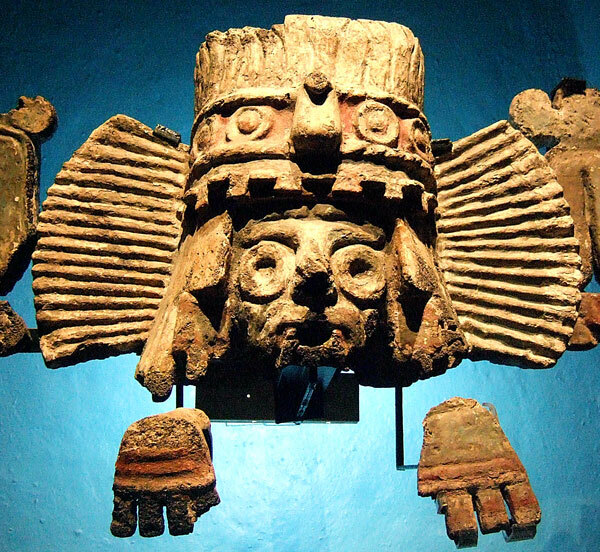 The Aztec people had been moulded largely out of two ancient ways of life: as Jacques Soustelle described them ‘the first element hunters and warriors, worshippers of a sun-god, and the second settled peasants whose deity was the god of the rain’. This is so clearly reflected in the twin temples atop the main temple of Tenochtitlan, dedicated to Huitzilopochtli (right) and to Tlaloc (left) (Pic 9). A warrior who died in battle, or as a sacrificial victim, became a privileged ‘companion of the eagle [Tonatiuh - the sun]’, accompanying Tonatiuh every morning on his journey to the midday zenith. After 4 years he was reincarnated as a humming-bird or butterfly. 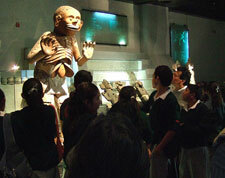 The warrior’s heaven was shared by women who died in childbirth and by merchants killed while on trading expeditions. 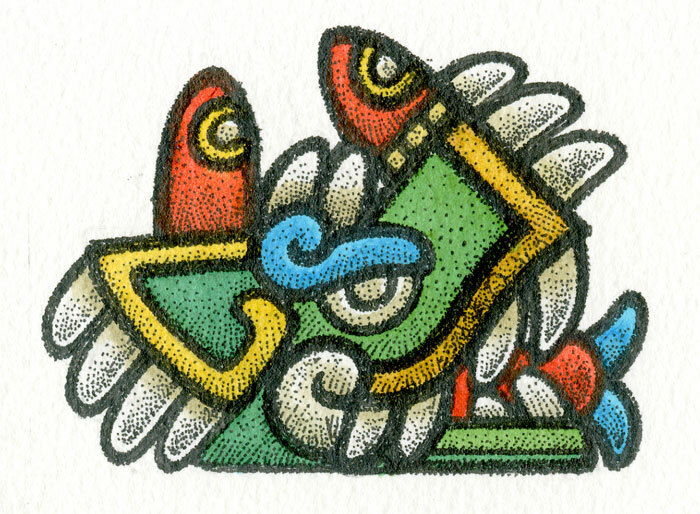 Those who died by drowning, or were struck by lightning, or from an illness believed to be related to the gods of water (such as dropsy or gout) went to Tlalócan, Tlaloc’s paradise, a place of abundant food, peace, growth, eternal spring, and where suffering was unknown. 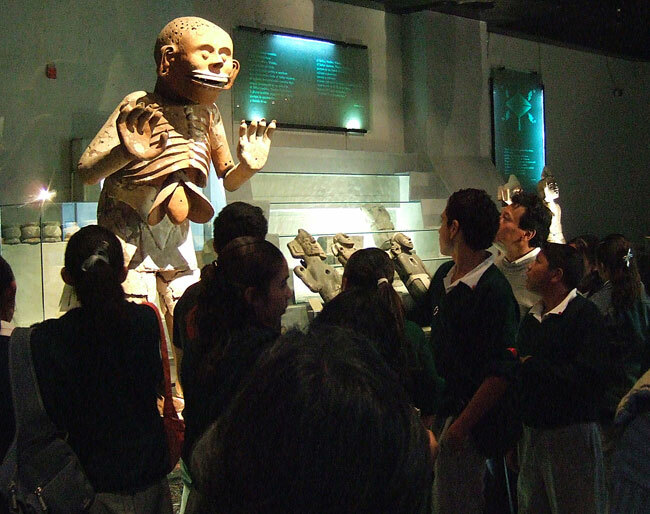 Finally, babies who died in infancy went to a fourth heaven, near Tlalócan, where a tree dripped milk from its branches, and where the infants waited to be given a second ‘chance’ of life, after the present world had been destroyed. So the two greatest paradises (for humans to go to) seem to have been strongly associated with SUN and RAIN deities. Was this your ‘soul’? Yes, but only one of them! 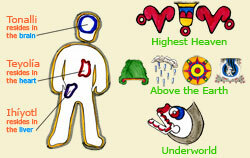 The Aztecs believed our bodies have 3 ‘spirit centres’, each linked to a different level of the universe (Pic 13). 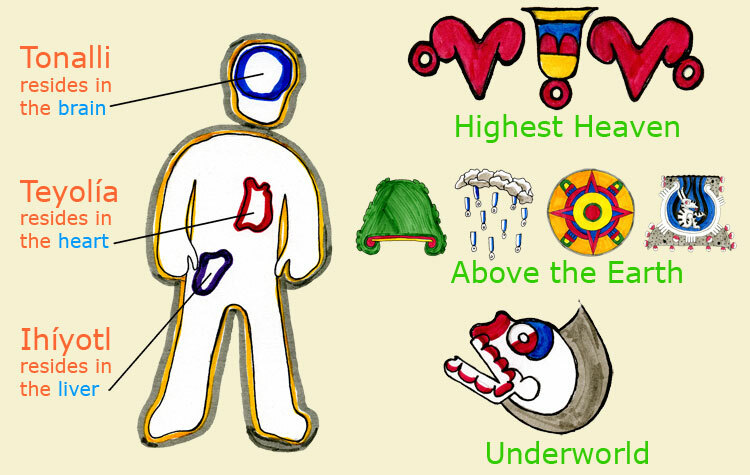 Your heart (‘yollotl’) is the home of the TEYOLIA (the essence of human life) - this was the only spirit that travelled to the afterlife, and was associated with the world above the earth. 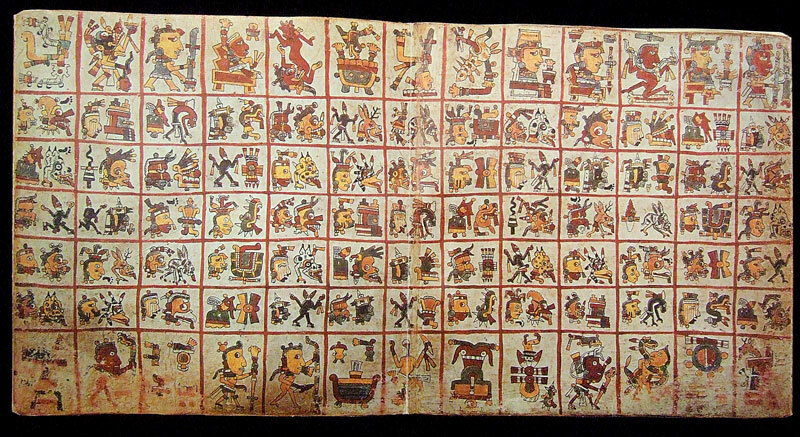 Your brain (‘cuatextli’) is the home of the TONALLI (the force of love and heat) - this stayed on earth to be kept by your family as ashes in a box with a tuft of your hair, and was associated with the highest heavens of the cosmos. 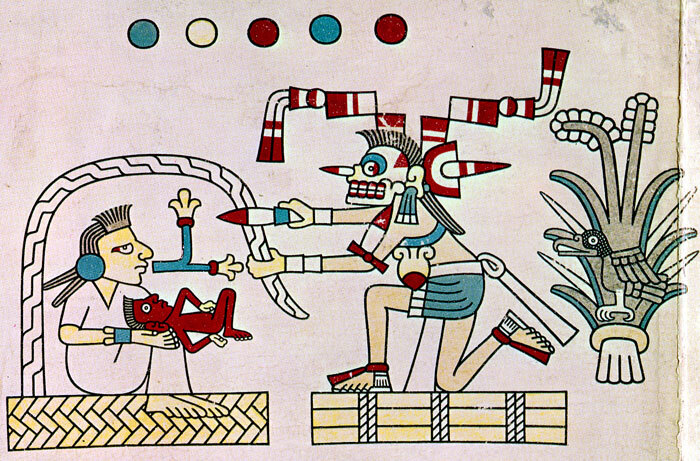 Your liver (‘elli’), being full of blood, is the home of the IHIYOTL (courage, the soul, the engine of passions but also the force of cold) - this was dispersed after death in winds, spirits and illnesses, and was associated with the underworld. 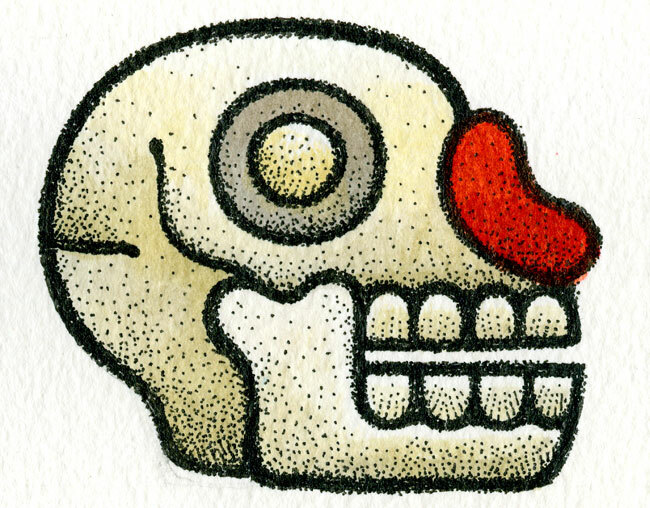 Did the Aztecs have their own ‘Day of the Dead’? Yes - in fact, they had several Feasts of the Dead, two of which (in our month of August, the 9th. and 10th. 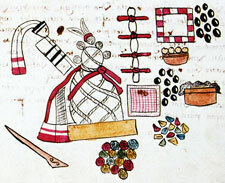 festival ‘months’ of the Aztec farming year) bore the names ‘Feast of the Little Dead Ones’ and ‘Feast of the Adult Dead’. A Spanish friar (Diego Durán) witnessed these festivities, a few decades after the Conquest, at the time of Allhallows/Saints/Souls in the Catholic calendar (ie when it is now) and wrote of his suspicions that ‘... the feast has been passed to the Feast of Allhallows in order to cover up the ancient ceremony’. 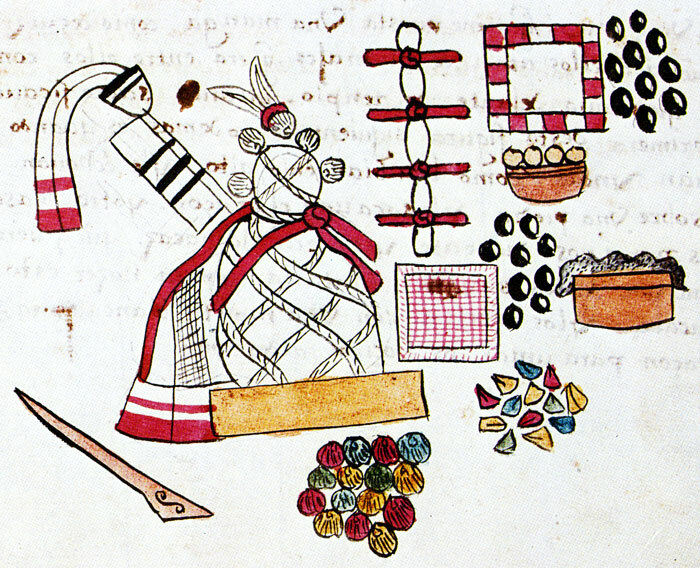 It was a time of preparing great flower garlands and of offerings of ‘chocolate, candles, fowl, fruit, great quantities of seed, and food’ on both days. The 10th. 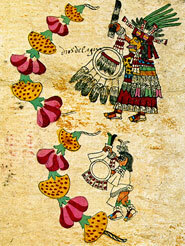 Aztec ‘month’, known as ‘Xocotlhuetzi’, included the pole-climbing ceremony (follow the link below) and involved plenty of music and dancing - two elements which, alongside the flowers (the yellow cempaxóchitl - Pic 15), food, incense and paper ornaments are common to both ancient and modern Day of the Dead festivals. 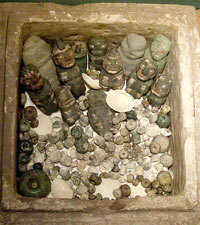 Offerings of food and drink, laid on tombs, carried on for 4 years after a person’s death, to give sustenance to the soul travelling (generally) to Mictlan. That we came to live on the earth. ’Everyday Life of the Aztecs’ by Warwick Bray (Dorset Press, 1968). I have heard that souls of those destined to go to the Mictlan afterlife in fact “ceasted to exist” in this place. Is is true that antient Aztecs believed in “soul mortality”? On the page titled: “Your Aztec birth date affected your whole life” it states “...Macuilxochitl or Xochipilli would cut the umbilical cord...”. Could pic 12 show a mother or child dying during birth? 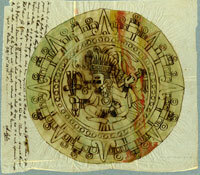 Mexicolore replies: Thanks for this interesting suggestion, Matt (Matt’s referring here to the Tec’s Summary for Kids in the article ‘Aztec Concepts of the Human Body 1’ by Molly Bassett); note, though, that the article was specifically referring to the fate of anyone born on one of the first four day signs (Crocodile, Wind, House, Lizard), rather than to a general principle.